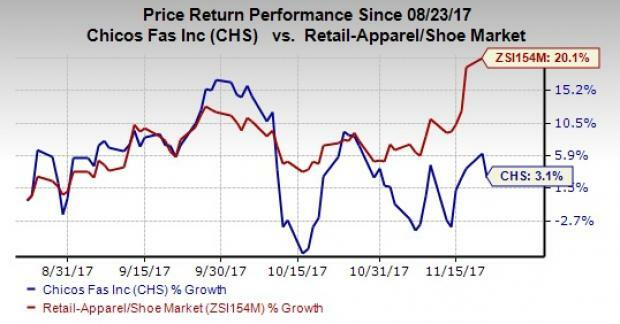 Chico’s FAS, Inc. CHS third-quarter fiscal 2017 financial results marked a significant improvement from the recent quarters as the company’s top and bottom-line results matched estimates. The results seemed to gain from the company’s progress on strategic initiatives to better serve customers and transform business. Further, it reflected the benefits from the organizational changes and operating efficiency initiatives. However, the company’s earnings and sales continued to decline compared with last year due to lower comparable sales (comps) and higher expenses. Additionally, the unfavorable impact from the recent hurricanes – Harvey, Irma and Maria, remained a deterrent. The hurricanes resulted in lower store operating hours due to the closure of more than 300 stores, alongside a fall in direct to consumer sales. Overall, the hurricanes had a nearly $10 million bearing on income from operations while it impacted earnings per share by 4 cents. Consequently, shares of the Zacks Rank #3 (Hold) company fell nearly 3.1% yesterday. While Chico’s stock has gained 3.1% in the last three months, it has widely underperformed the industry ‘s growth of 20.1%. Despite the impact of recent hurricanes, Chico’s reported earnings of 13 cents per share came in line with the Zacks Consensus Estimate. However, earnings declined 35% from 20 cents reported in the year-ago quarter. Net sales dropped nearly 10.8% year over year to $532.3 million, due to soft comparable store sales (comps). However, revenues were almost in line with the Zacks Consensus Estimate of $532.1 million. Comps declined 8.2% as a result of lower average dollar sale and a fall in transaction count. Segment wise, comps for Chico’s, White House Black Market (WHBM) and Soma brands witnessed a drop of 5.8%, 14.1% and 1.7%, respectively. Gross profit slumped 14.6% to $196.7 million, while gross margin declined 160 basis points (bps) to 37% due to store occupancy expenses deleverage and store impairment charges related to the hurricanes. This was partly offset by improved merchandise margin. Selling, general and administrative (SG&A) expenses fell about 9% to $171.4 million, due to lower employee-related costs and marketing expenses. However, as a percentage of sales, SG&A expanded 70 bps to 32.3%. Backed by tepid sales and lower gross margins in the quarter, income from operations declined 18.6% to $25.3 million, while as a percentage of sales it contracted 50 bps to 4.7%. Chico’s ended the quarter with cash and cash equivalents of $125.6 million, inventories of $265 million, long-term debt of $57.3 million, and shareholders’ equity of $635.4 million. During the nine months of fiscal 2017, the company generated $94.8 million of cash from operating activities. In the fiscal third quarter, Chico’s repurchased 0.6 million shares for $5 million under its $300 million buyback plan announced in November 2015. As of Oct 28, 2017, the company had $137.9 million worth authorization remaining for repurchase. During the reported quarter, Chico’s closed a total of eight stores, including seven frontline boutiques across all brands and one WHBM outlet. This was in sync with the company’s ongoing strategy to improve the productivity of store fleet. The company did not open new stores in the quarter. Its total store count is pegged at 1,474 as of Oct 28. Chico’s remains on track with cost control and operating efficiency endeavors declared last year. The company expects to achieve annualized savings of $100-$110 million by mid-2018. In this regard, it has achieved savings worth more than $100 million to date, and sees significant opportunities in fiscal 2018. Particularly, the company anticipates saving on merchandise margins in fiscal 2018 through its sourcing initiatives and SG&A savings. For fiscal fourth quarter, the company expects comps to decline in high single-digits range, excluding the impact from the additional 53rd week. The additional week is expected to add about $30 million to sales. Moreover, Chico’s anticipates gross margin to be in the range of flat to slightly up. SG&A expenses are projected to decline compared with last year, partly offset by additional costs from the 53rd week. Management now projects capital expenditure of $45-$50 million for fiscal 2017, down from the previous guidance of $55-$60 million. Better-ranked stocks in the same industry include American Eagle Outfitters Inc. AEO , The Children’s Place Inc. PLCE and Abercrombie & Fitch Company ANF , each carrying a Zacks Rank #2 (Buy). You can see the complete list of today’s Zacks #1 Rank (Strong Buy) stocks here . American Eagle has gained nearly 23% in three months. Moreover, it has a long-term earnings growth rate of 8.7%. Children’s Place has a long-term EPS growth rate of 9%. Further, the stock has returned 24.6% in the last three months. Abercrombie & Fitch has surged a whopping 73.3% in three months. Further, the company has a long-term EPS growth rate of 14%.